Are you bored of your own cooking? I can relate, I was so bored of my own cooking a few months ago. Luckily, I came across Emeals, a meal planning service that will provide you with a new weekly meal plan and grocery shopping list according to your chosen diet for as little as $5 per month. I have been using the Paleo meal plan for lunch and dinner since November and I love it. It helps save time and money in the grocery store and has helped me to develop my cooking skills. Below is a fabulous recipe I received today from Emeals along with my new meal plan for the upcoming week. I look forward to enjoying this meal later in the week, I hope you enjoy it too! Combine tomato, avocado, cilantro (if using), lime juice, garlic powder and 1/4 tsp each salt and pepper. Sprinkle fish with remaining 1/4 tsp each salt and pepper. Cook fish in hot oil in a nonstick skillet 3 to 4 minutes per side or until fish flakes with a fork. 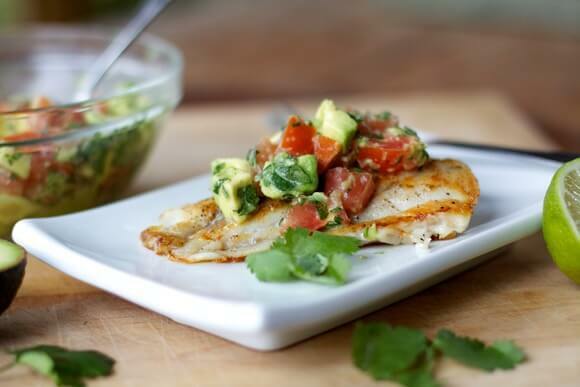 Top with Tomato-Avocado Salsa.